← To Tweet or Not To Tweet During a Disaster? The 2011 Thai Floods was one of the country’s worst disasters in recent history. The flooding began in July and lasted until December. Over 13 million people were affected. More than 800 were killed. The World Bank estimated $45 billion in total economic damage. 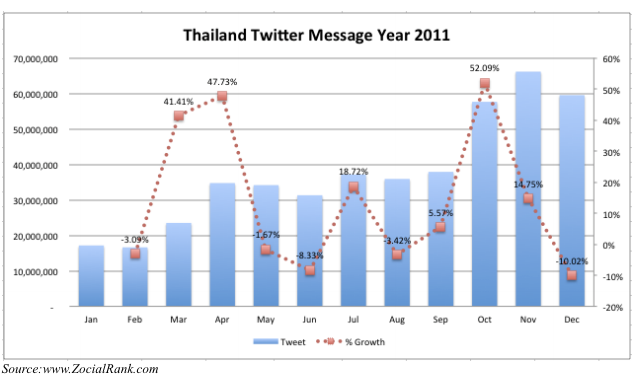 This new study, “The Role of Twitter during a Natural Disaster: Case Study of 2011 Thai Flood,” analyzes how twitter was used during these major floods. Situational Announcements and Alerts: Tweets about up-to-date situational and location-based information related to the flood such as water levels, traffic conditions and road conditions in certain areas. In addition, emergency warnings from authorities advising citizens to evacuate areas, seek shelter or take other protective measures are also included. Requests for Assistance: Tweets requesting any types of assistance; such as food, water, medical supplies, volunteers or transportation. Other: Tweets including all other messages, such as general comments; complaints and expressions of opinions. The results of this analysis are shown in the figures below. The first shows the number of tweets per each category, while the second shows the distribution of these categories over time. 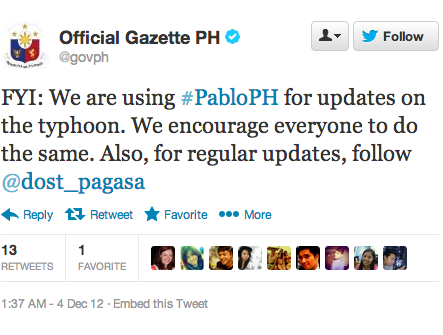 This entry was posted in Crowdsourcing, Humanitarian Technologies, Social Computing, Social Media and tagged Bangkok, Disaster, floods, Pablo, Philippines, Thai, Twitter, Typhoon. Bookmark the permalink. Technology is truly amazing. And who said twitter was a useless, pointless thing? 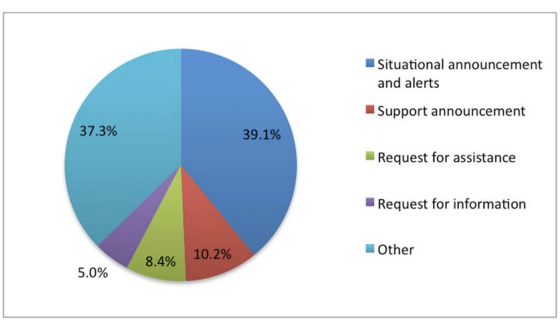 Where can we have access at least to the first page of the article: “The role of Twitter during a natural disaster: Case study of 2011 Thai Flood”. I found this article in the IEEExplore website, but there we cannot even see the first page, and therefore we do not know if we want/need to buy it. That is so frustrating. Thank you for your attention. A. S.
Pingback: Disaster Management: Role of Social Media | Orkash Services Pvt. Ltd.